Easy to use tap-on/tap-off smart card and mobile technology. Information captured in real-time, reducing manual data entry. Carers have mobile access to all client and case management documents. 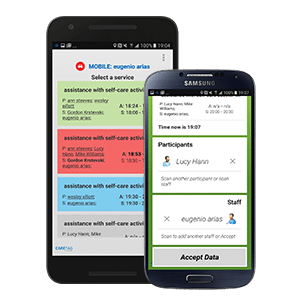 Utilising smart card and mobile technology, service requests are initiated, processed and completed by client and carer tapping on and off at all stages of the service delivery cycle. Information is captured electronically in real time from anywhere, anytime resulting in less manual data entry in the field. Capturing support delivery information such as staff and client T&A, support details, location and transport details furthermore, the field support staff has full access to service and client information, case management documents and case notes generation minimising double entries as well as handling of physical documents.